You may have noticed I've been posting more book reviews recently. In addition to analyzing data and writing, reading is one of the main ways I spend my time, down- or otherwise. This year, I've challenged myself once again to read 48 books. I'm already 4 books in and it's only January 16. I've also had some pesky insomnia recently, so reading is one of the things I do when I can't sleep. But I've mostly been reading short books so far, so I know that rate will decrease once I get to some of the much longer books on my list. 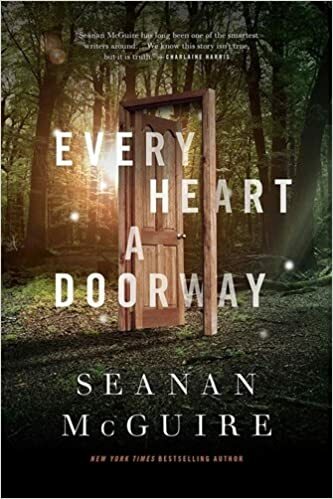 Which brings us to the book I just finished last night, Every Heart a Doorway by Seanan McGuire. Another instance of young adult fantasy, which I discovered in my first Goodreads data analysis, is the only kind of young adult books I read. The book takes place at a Home for Wayward Children. While the headmistress, Eleanor West, tells the family of these children that she will help heal their children of their delusions about other magical worlds, in actual fact, her school is a place for children who have stepped into a magic world of some kind and then have to deal with the heartbreak of being expelled from it for one reason or another. That's right, these are the children that ended up in places like Narnia or Oz (though only Narnia is brought up in the book, and dismissed as fiction), after stepping or being pulled through some kind of magical doorway. Each child is broken in some way and longs to return to their magical world, or at least, longs to deal with the pain of being thrown out. The story starts when Nancy is sent to the school by her parents, after having disappeared into the Land of the Dead and returned much later with a strange tale about where she had been. She is paired with the bubbly Sumi, who spent her time in a High Nonsense world, as her roommate. There, Nancy learns that the magical worlds use a different kind of compass, one where the major coordinates are Nonsense, Logic, Virtue, and Wickedness, in place of North, South, East, and West, and that each child returns from their world changed. She hopes to simply fit in at the school, but then one of her classmates dies. As a former resident of the Land of the Dead, some of the suspicion falls on Nancy. She and her newfound friends try to find out what is happening and who is responsible. The book (a novella) is a quick read and beautifully written. Seanan's prose is very poetic and thought-provoking at times. As she gets farther into the story, and begins the murder mystery angle, her prose becomes a bit more descriptive and less poetic. I'm not terribly surprised that Every Heart a Doorway has won so many awards. But I have to say, I was a bit disappointed when she made that shift to more descriptive writing, because I was really enjoying the beauty and wordplay. The story of children being taken to magical worlds suited to their underlying personality traits is an apt metaphor for difficulty "fitting in" experienced by so many children and teenagers. But Seanan also takes on topics teenagers (and adults) struggle through, like sexuality and gender identity directly. I'll definitely be checking out Seanan's other books, including the two other Wayward Children books.